Fire Rated Steel Access Doors are designed specifically for wall installation and feature a 1.5 hour certification. It includes self-latching doors, self-closing door mechanism and comes with knurled knob and flush key for universal bolt. The sizes refer to the access door size without the frame – in order to calculate minimal opening simply add 3/8”. The FB-5060-8X8 from Acudor is a 8” x 8” Fire Rated Access Door, Steel. It's designed to maintain co.. The FB-5060-10X10 from Acudor is a 10” x 10” Fire Rated Access Door, Steel. It's designed to maintai.. 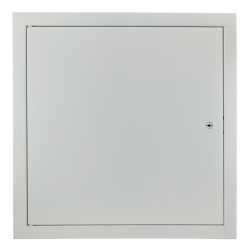 The FB-5060-12X12 from Acudor is a 12” x 12” Fire Rated Access Door, Steel. It's designed to maintai.. The FB-5060-14X14 from Acudor is a 14” x 14” Fire Rated Access Door, Steel. It's designed to maintai.. The FB-5060-16X16 from Acudor is a 16” x 16” Fire Rated Access Door, Steel. It's designed to maintai.. The FB-5060-18X18 from Acudor is a 18” x 18” Fire Rated Access Door, Steel. It's designed to maintai..